Make each purchase create livable, healthy and sustainable communities. Here's to all the great energy, spirit, beauty and creativity our mothers have spawned! Why isn’t orange juice in a container made from orange peel? Why should a business make anything that it can’t use or sell? A toxin is a material in the wrong place. A tool is good or bad by the intention of the wielder, it depends on how it is used. Knowing better but doing it anyway is negligence. Regulations are a signal of design failure. We need to move from taking more than we give, to giving more than we take. Trees are essential to our cities, to take our carbon dioxide and give us back oxygen, to provide cooling shade, and to play their part in complex urban ecosystems. There is a growing body of research suggests that we need them for much more than that. Trees absorb stormwater, helping reduce runoff. They clean the soil. They promote economic vitality, raising property values and subtly encouraging shoppers to spend more time spending money. They reduce our stress levels and might even help reduce violent crime. None of this is news to the folks at the Greening of Detroit, a nonprofit working to grow a greener, leafier city since 1989. And while the Greening is well-known for its work promoting, planting, and caring for trees, it remains what Rebecca Salminen Witt, president of the Greening of Detroit, calls "an organization on the move" and is continually finding new ways to support a more sustainable Detroit. "10 or 15 years ago," says Salminen Witt, "it became really clear to us that food security was an ongoing issue in the city. We were folks who knew how to grow things, so neighborhoods would come to us and ask if we could help them garden. At the same time, vacant space was becoming more prevalent in the city. So we started thinking, 'OK, there's a food security issue, we know how to grow things, and there's this new resource in our vacant land -- we can put all these things together into a gardening movement.'" So began the work that would lead, garden by garden, to the Garden Resource Program (GRP), a Greening initiative that eventually came to support some 1,300 individual gardens throughout the city. 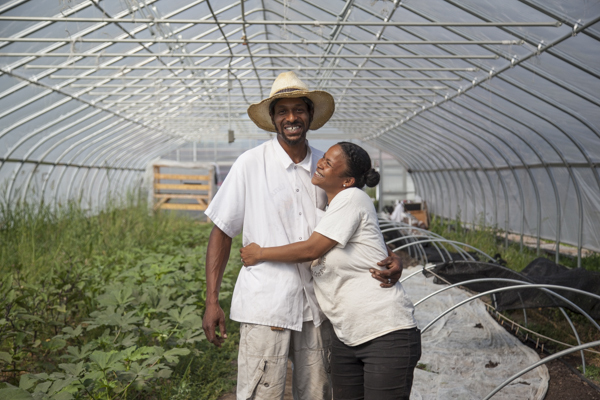 The work that the Greening started with the GRP has since spun off into its own independent organization, Keep Growing Detroit, but the Greening remains connected to urban agriculture in Detroit in meaningful ways. Since 2012, it has managed the Detroit Market Garden, a 2.5-acre farm adjacent to Eastern Market and the Dequindre Cut that was developed as a "demonstration of what can be done with vacant property in the city of Detroit, and how it can add to the economic value of a district," according to Tepfirah Rushdan, the Greening's director of urban agriculture. The Market Garden, which contains four solar passive hoop houses in which herbs and vegetables are grown year-round, distributes food to area institutions and restaurants, as well as the Gleaners Food Bank and local farmers markets. It is also used to provide educational opportunities to folks who want to make a living growing food in the city. Natural capital valuation offers water companies a powerful tool to identify sustainability challenges, engage stakeholders such as the chief financial officer and drive innovation in low-carbon technologies, a recent meeting of water industry executives concluded. Natural capital valuation is a way of putting a monetary value on natural resources such as water, clean air, a stable climate and plentiful land, forests and oceans. At present, our economic system takes these natural resources for granted, yet we all rely on them for our continued prosperity and well-being. By putting a price on natural resources that reflects their real value, we can encourage business and society to use them in a sustainable way. In Australia – a country that is already suffering extreme weather including droughts and wildfires – Yarra Valley Water commissioned research to calculate the value of water in Melbourne. The study found that the value was three times higher than official water prices. The results helped inform debate on how to balance customer demand with the need to conserve and enhance water resources. The 2014 drought has cost California’s economy $2.2 billion, according to a report from the University of California, Davis. The UC Davis Center for Watershed Sciences study updates estimates on the drought’s effects on Central Valley farm production, presents new data on the state’s coastal and southern farm areas, and forecasts the drought’s economic fallout through 2016. The study found that the drought — the third most severe on record — is responsible for the greatest water loss ever seen in California agriculture, with river water for Central Valley farms reduced by roughly one-third. Some 428,000 acres, or 5 percent, of irrigated cropland is going out of production in the Central Valley, Central Coast and Southern California due to the drought. Consumer food prices will be largely unaffected. Higher prices at the grocery store of high-value California crops like nuts, wine grapes and dairy foods are driven more by market demand than by the drought. "The good news is that disclosure of the most important environmental metrics by the biggest companies has become table stakes: 88 percent of the 100 largest US companies now disclose their greenhouse gas and energy metrics, while 65 percent disclose water use. Across the entire ranking universe, if a company is not disclosing greenhouse gases, energy, water or waste, it is now offside, playing catch-up with its peers. This is remarkable considering that most of these metrics are not subject to mandatory disclosure in most countries." Disclosures benchmarking environmental factors such as greenhouse gases now makes it possible for investors to incorporate this information into their investment strategies. And early returns on the data show that greener investment is smarter investment. Corporate Knights Capital (the research partner for Newsweek’s Green Rankings), reports that an investment of $100 equally spread across U.S. companies that performed better than average on greenhouse gas emissions would have returned $220 dollars over the past five years, versus $160 by investing in the S&P 500. Investing into these green companies also led to 93% fewer emissions than an equal investment in the S&P 500. Only a third of consumers regularly consider sustainability in their purchasing decisions, according to a global study by Accenture and Havas Media Re:Purpose. The report, From Marketing to Mattering, is based on a survey of 30,000 consumers in 20 countries. The study was commissioned in response and as a companion to the UN Global Compact-Accenture CEO Study on Sustainability, published in 2013, in which two thirds of CEOs admitted that business is not doing enough to address sustainability challenges, similar to the 73 percent of consumers in the latest research that say businesses are failing to take care of the planet and society. The two studies reveal that, although CEOs see engagement with consumers as the most important single factor motivating them to accelerate progress on sustainability, they are often out of step with what motivates consumers to buy sustainable products and services. And finally, to no surprise, consumers are also critically concerned with cost. Although many consumers are willing to pay a higher premium for green, healthy or sustainable products, many others still heavily weigh cost in making final purchases, and this is what most CEO's are still focused on in their leadership roles. If CEOs hold the key to climate change, why aren't they driving? Consumers may not realize it, but there are a lot of 'pieces of the sustainability pie' that must be put in place in the manufacturing world to bring green or sustainable products to market. All of the pieces involve managing various internal processes, while keeping increasingly complex external risks under control as well. Although two of the biggest concerns in supply-chain management are risk and sustainability, they are often viewed separately when they should be addressed concurrently in strategic and operational plans, according to a report by The Conference Board. The report goes on to warn that keeping the two areas separate may ultimately put firms at considerable risk. The report notes that there are two broad categories of internal supply chain risk: actions taken within the firm and the firm’s policy decisions. It also lists a number of internal supply chain risk categories, including policies, resources, operational and time compression. In contrast, external supply chain risk categories include governmental actions, infrastructure deficiencies, supplier difficulties, logistical problems, price, terrorism, natural disasters and accidents. Sustainability includes environment factors, social responsibility and organizational sustainability, all of which invariably having consequences in the others. Consequently the most effective companies are now addressing supply chain risk and sustainability as critically linked pieces of their strategic plans and operations. According to Nada Sanders of the EcoNautics Sustainability Institute at Lehigh University, with more and more conscientious consumers and growing limits to resource availability, successful companies in the future will be those that have both sustainable supply chains and operations. Supply Chain Management: Is It Still the Next Big Thing?